This is a copy of an e-mail alert that I received on November 03, 2010 from Bonnie's Blog of Crime. 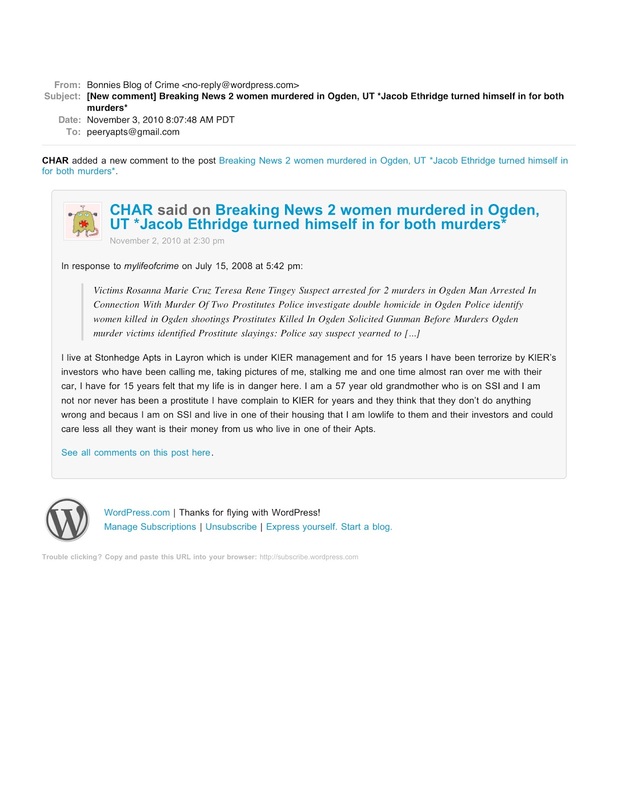 It is in regard to a blog that I subscribe to, pertaining to the murder at the building in July, 2008. It's from a 57 year old woman named, "CHAR", who lives at a Kier property called, The Stonhenge Apartments in Layton, UT. It details her experience with Kier Property Management and their employees over the past 15 years. 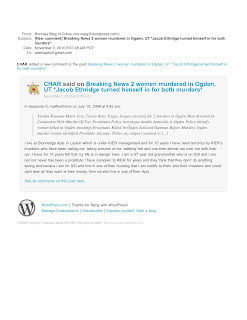 I submitted a post to this Blog, in part to find out if any of the murdered woman's friends or relatives had ever lived in a Kier owned or managed property and if so, what their own experience with Kier Property Management was like, regarding building safety and security. As you can see, Kier not only had a habit of treating MY tenants poorly, they apparently have a habit of treating their other tenants, (as this woman puts it) like "low-life's." A low-life or lowlife is a term for a person who is considered morally unacceptable by their community in general. Examples of people who are often called "lowlifes" are prostitutes, drug addicts, drug dealers, alcoholics, the significantly mentally ill, hustlers, pimps, slumlords, criminals, spammers, corrupt officials or authority figures and uncontrollable wobblers. Often, the term is used as an indication of disapproval of antisocial or self-destructive behaviors, usually bearing a connotation of contempt and derision. This usage of the word dates to 1911. 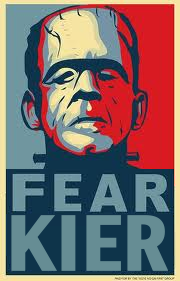 Kier Corporation: - Quality Property Management you can count on. 'Poor' is a quality, right?